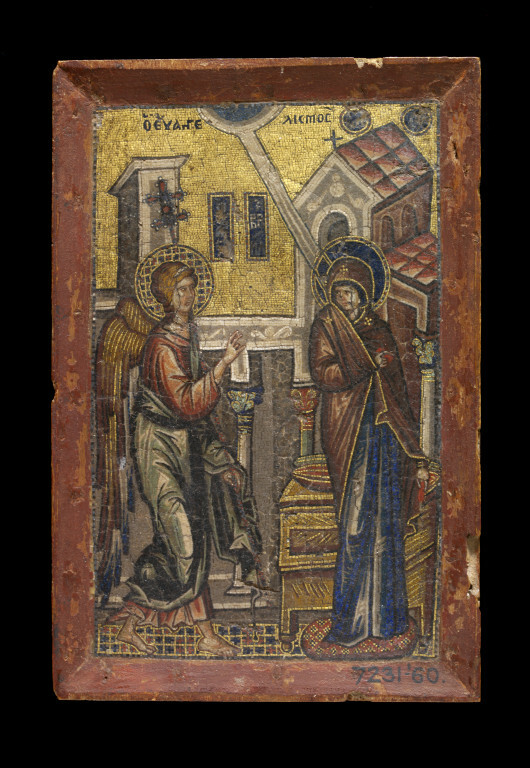 The small size and exquisite craftsmanship of this Annunciation suggest it was intended for private devotion in a rich household in Constantinople. Small mosaics like this were also in great demand in Italy. The inventory of Cardinal Pietro Barbo (later Pope Paul II) in 1457 shows that he owned 25 such pieces. It is a noteworthy fact that few such mosaics have survived even though they appear to have been made in fairly large numbers - medieval artisans, 'artists' we now say, were busy, business-like and industrious. The panel is entitled 'The Annunciation' (in black Greek letters across the top). The two figures are likewise identified in inscriptions: the Archangel Gabriel and Mother of God (the letters in both inscription panels are damaged). Else-where there are signs of ancient abrasion and damage and of repairs. The technique of miniature mosaics was to set the tesserae in wax on wood. Although one might have presumed that the tiny tesserae were of coloured stone and glass (with the gold and silver tesserae having wafers of leaf sandwiched in glass or alternatively with the gold tesserae made of gilded copper), the Museum has always described the cubes as of gold, silver, lapis lazuli and other semi-precious stones. The mosaic shows the moment of the announcement by the Angel Gabriel to Mary: 'You shall conceive and bear a son, and you shall give him the name Jesus' (Luke I.26-38). The festival is celebrated on 25 March. The attributes of the figures are well known in Byzantine art. The archangel holds one hand up in a gesture of speech and in the other holds a sceptre, tipped with a highly ornate cross motif; probably this is the emblem of the fleur-de-lys. Mary holds a distaff, alluding to the Apocryphal Gospels in which she has an upbringing in the Temple at Jerusalem and where she Would spin and weave the priest's vestments. A beam comes down from heaven, and, as more usual in Byzantine art, there is no dove of the Holy Spirit descending within the light. 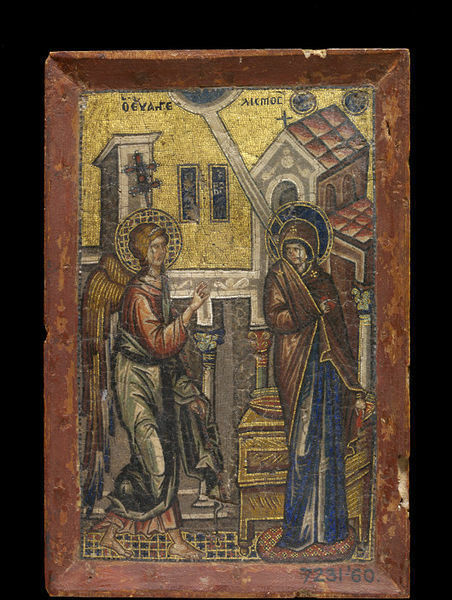 This little Constantinople-made mosaic panel shows the Archangel Gabriel bringing the news to Mary that she is pregnant with Christ. Behind the two figures is a rather Byzantine-looking architectural complex: as we would expect, the setting and costume for this ancient tale is contemporary and recognizably 14th century Byzantine. The mosaic was purchased from the Webb Collection, having previously been in the possession of M. Delange, who it is believed acquired it in Italy. It is a noteworthy fact that few such mosaics have survived even though they appear to have been made in fairly large numbers - medieval artisans, 'artists' we now say, were busy, business-like and industrious. For instance, twenty-five are listed in the inventory of Pope Paul II's (Pope from 1464 to1471) collection alone. What, then, was the purpose of this object; what was it made for? It has 'been assumed' (D. Buckton, 'Byzantium: Byzantine Treasures from British Collections', British Museum catalogue, London, 1994, cat. no. 220) that pieces such as this one were made as icons for devotional use in church, but their small size and 'highly decorative character' (Buckton, ibid), questions this hypothesis. This particular piece is of exquisite workshop. Mosaicists seem to have well-regarded and in demand, and this is probably one of the finest pieces of their craft that has survived down the ages to us. It is possible that this miniature mosaic was made for export for Venice, since this is exactly the sort of object that was, but it is just as likely to have been made for a high-powered member of the Byzantine Imperial court. 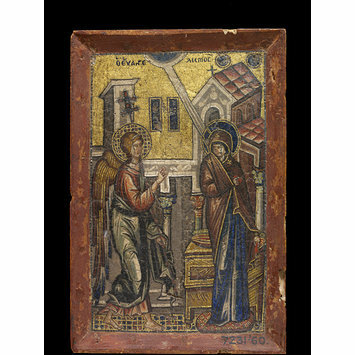 The small-scale of the piece, combined with the great skill and richness of its execution, suggests that this piece, and others like it, were made instead as private devotional pieces for Byzantine aristocrats, to contemplate and pray to within the privacy of their own manor houses and chapels. The style employed by Byzantine mosaicists was a relatively conservative one, hence Kondakoff's dating of this object to the Comnenian period - that is to say 1057-1185 ('Hist. et Monum. des Emaux Byzantins', 1892, p.102). Their early work influenced Romanesque English painters decorating churches who associated their mosaics with richness and Roman power, but their craft developed at a slower rate than that of painters, sculptors and manuscript illustrators, since the nature of their art was restricted by the very technique of mosaic art. The use of cubes of semi-precious stones, glass and metals gave a glittering finish well-suited to conveying messages of the majesty and divine power of God and Christian faith, but it of course also limited the mosaic-artists to producing highly stylised flattened images made up of squares; the problem was the same as that facing, much later on, the pointilist. The iconography used here is also pretty conventional: the attributes seen here - the beam coming down from heaven, the lack of a dove of the Holy Spirit, the fleur-de-lys-tipped septre held by Gabriel - are well known in Byzantine art. That said, this piece can be safely dated to the early 14th century by the high degree of interest in light and shade, and in the representation of the folds in drapery and other naturalistic detail, that are classic characteristcs of Byzantine mosaic art in the 1300s. What is more unexpected, however, is the timid expressions and postures of the figures. Mary seems to shy away from the Archangel, who himself appears slightly ill-at-ease and uncomfortable, perhaps to convey a sense of the privilege, but also the awesome, massive responsibility that has fallen to Mary. The colours and the light effects lend the scene a sense of hope and goodness, but the characters, both crowned with richly ornamented haloes, almost overwhelmed by the scale of the occasion. See D. Buckton, 'Byzantium: Byzantine Treasures from British Collections' (British Museum catalogue, London, 1994), cat no. 220, for a full bibliography relating to this object.